Helirig's swift and precise service is adaptable for engineering, construction or transportation projects in remote rural or complex urban environments. Unmatched experience lifting heavy loads in remote rural locations and tight, complex urban neighborhoods. Lifting projects carefully planned and managed from start to finish. Helirig handle permits and licenses so you don’t have to. With unparalleled industry experience negotiating the most difficult terrains and logistical challenges, Helirig's world-class piloting guarantees a smooth, safe and efficient lift. A fixed line of 50m and sometimes longer gives Helirig access to particularly tight locations and reduces potentially damaging rotor down-wash. Pilot, ground crew and helicopters work together to lift loads of up to 5000kg safely and precisely. Helirig helicopters work in adverse weather conditions. Strong winds can even give our helicopters greater lift, while maintaining safety and millimeter accuracy. Deploying Helirig's proficient helicopter lifting service has numerous advantages helping save time, money and complexity. Other lifting methods require extensive enabling work, such as strengthening substructures, protecting vulnerable underground services or modifying kerb lines. Work is completed swiftly and efficiently. Projets that would take days or weeks subject to weather conditions and road closures, is wrapped up in minutes with Helirig. The manpower and coordination to organize complex enabling work and road closures is extensive. You can do everything right and then adverse weather conditions can delay or cancel a lift. Helirig’s specialist helicopter lifting services bypasses these concerns. The contexts and applications of Helirig's specialist service is constantly expanding and evolving. 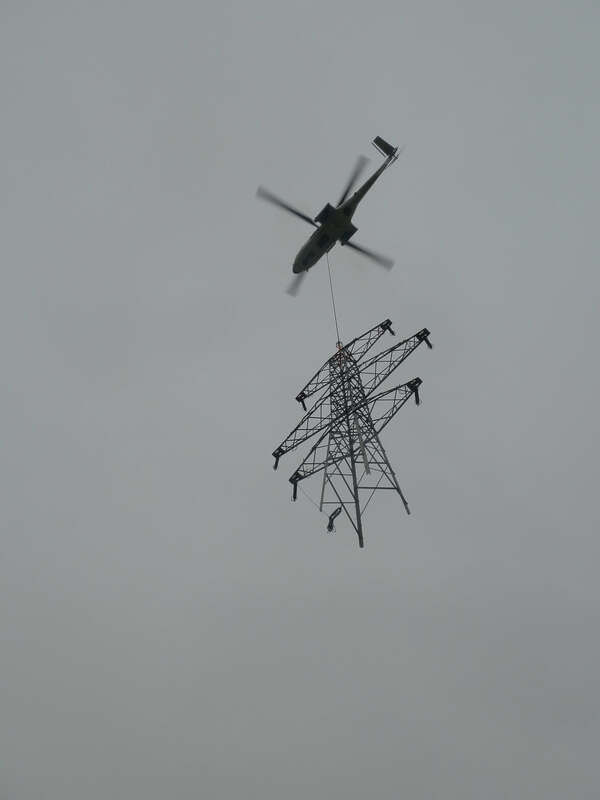 Helirig have extensive experience building and maintaining power lines. The increased use of helicopters in the industry is testimony to their efficiency and competency against tough deadlines. Costly access solutions to remote rural areas can delay or even prohibit work on power lines. Mountains, steep terrain, SSSIs, moorlands or peat bogs are no barrier to Helirig helicopters and crew. Helirig's experienced team lifts with millimeter accuracy, negotiating complex and challenging urban environments. 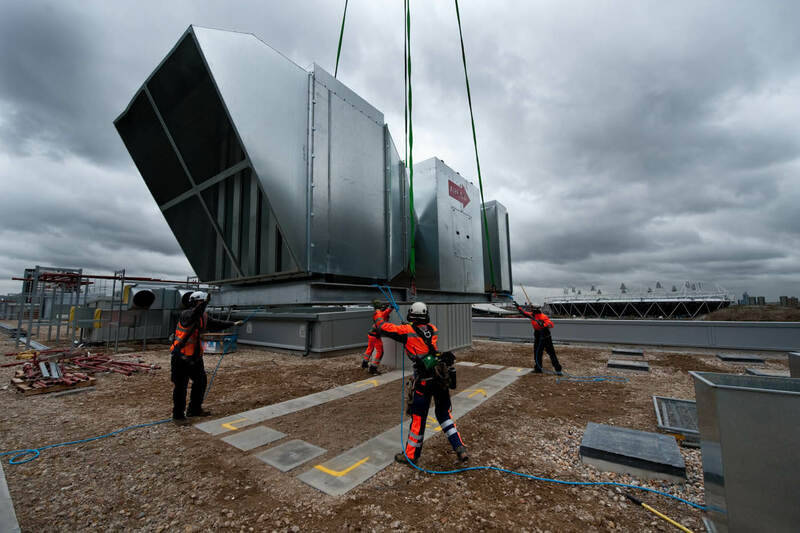 We guarantee a successful lift from ground to rooftop for chillers, air-conditioners, fan units and more. Helirig will lift your air conditioning units, fans and any other equipment to your rooftop quickly and safely with millimeter accuracy. If you have difficulty with road closures, or if the ground cannot support crane outrigger loads, then lifting by helicopter could be the solution you hadn’t yet thought of. Helicopters can operate at high wind speeds, limiting the need for multiple contingency plans, delays and disruption to traffic. Helirig’s expert helicopter lifting service can be adapted for a wide range of projects. Using a helicopter could be the ideal solution for your personal or business project. Get in touch to see how Helirig can work with you. We translate our unparalleled technical expertise generated in the construction sector for a wide variety of unexpected uses. Helirig worked with film director Chris Nolan on the opening aerial stunt for The Dark Knight released in 2012. Find out here about how a precise, controlled helicopter lift can assist complete a stunning visual effect. 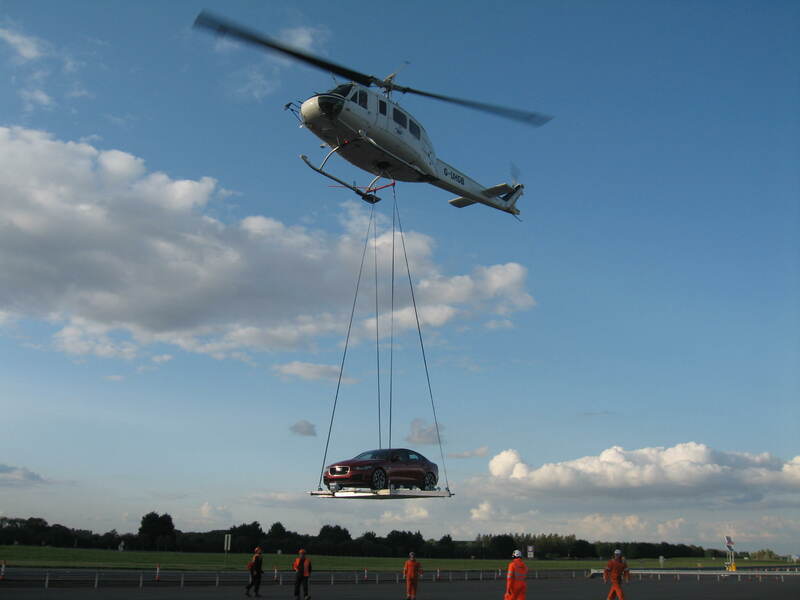 In 2014 Helirig participated in the world premiere of Jaguar’s XE, carrying the new car across the London skyline. Contact Helirig to find out how we can improve your brand/PR event. Helirig have capacity to work in a range of sectors including railway construction, individual projects, etc.